Okra – Scientific name: Abelmoschus esculentus L.
Coarse, erect, branched, annual herb, 0.6 to 1.5 meters high. Leaves are long-petioled, orbicular or orbicular-ovate, about 25 cm long; heart-shaped base; margins, 3- to 5-lobed. 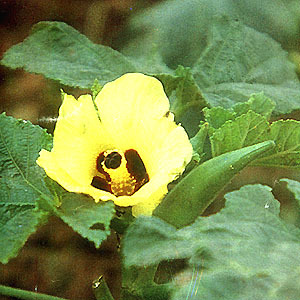 Flowers are axillary and solitary; corolla, large and yellow, and inside, deep purple at the base. Fruit is elongated, 10-25 cm long, 1.5 – 3 cm in diameter, tapering to a blunt point and containing rows of rounded, kidney shaped seeds. Cultivated for its edible fruit. Ubiquitous in market places. Roots, leaves, young pods, seeds. Contains vitamins A and C. A good source of iron and calcium. Also contains starch, fat, ash, thiamine and riboflavine. Decoction of roots and leaves as a tea or for washing. Decoction of young fruit useful for catarrh, urinary problems. Syrup from mucilaginous fruit used for sore throat. Poultice of roots and leaves for wound healing. Young pods for fevers, difficult urination and diarrhea. Decoction of roots for headaches, varicose veins, arthritis, fevers. Decoctions of leaves for abdominal pain. Leaves also useful as emollient poultice. Seeds used a coffee substitute. Paste of seeds, mixed with milk, used for pruritic skin lesions. This entry was posted in List of Medicinal Plants in the Philippines and tagged okra on March 23, 2009 by Pinoy Herbs. how can i used okra for my varicose veins?